Ken Weathersby is now an established artist in New York where he settled soon after he graduated from Southern Miss. His attention actually goes to formal problems he attacks via the concept of the maze. This organized approach of questions of vision and orientation were already notable in his student years when he prepared his BFA in Hattiesburg. Our painting is a research about the visibility of color, the effect of juxtaposition, the vibration and absorption exerted by the field. 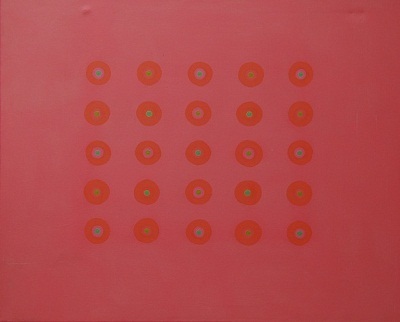 The little kaleidoscopic circles, built with or towards values of hardly definable greens, swim in the overwhelming presence of rose: a hallucinatory effect. He achieves with color what Lucy Webb achieves with line. Ken treats the problem not without a surprising sense of beauty.